Does the proposed National Housing Fund Act offer equal opportunities for every Nigerian? On February 18 2019, the National Assembly passed the National Housing Fund (Establishment) Act 2018, a newly proposed Act that repeals the National Housing Fund (NHF) Act, Cap. N45, Laws of the Federation of Nigeria, 2004. NHF explained in the Act that the new law was reviewed to provide for additional sources of funding for effective financing of housing development in Nigeria and for related matters. Going by that, it simply means that the intention is to improve the well-being of people through sustainable development by investing in housing. But, a critical look at the provisions of the new law raises a number of questions. To put things in perspective, the NHF was established by the NHF Act of 1992 to mobilise funds that will facilitate the provision of affordable housing for Nigerians. Under the current NHF law, every Nigerian earning N3,000 or more per annum is required to contribute 2.5 percent of their monthly basic salary to the NHF. 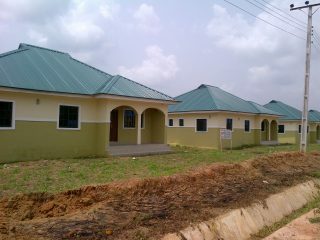 The funds mobilized will be made available to contributors at affordable interest rates to build homes. From every indication, the revised NHF law does not avail equal opportunities for Nigerians, especially low-income earners. Another factor is that the interest on contributions (2 percent) is hardly rewarding and fails to compensate for the time and value of money. Contributors are expected to benefit from the scheme, unfortunately only a few stand to gain from it. The large majority will have to withdraw their contributions once they attain the age of 60 years or after 35 years of service. But since the interest is relatively insignificant, there would be little or nothing to cash out.